Very often, companies that decide to outsource fall into the trap of thinking that the entire outsourcing process is complete as soon as the contract is signed. Rather than signifying completion, signing a contract is only the start of a business relationship, and diligent management oversight is necessary at all times thereafter. Whether yours is a big corporation or a small business, if you plan to regularly outsource various kinds of work, you will need to set up a systematic framework to manage your outsourcing process. 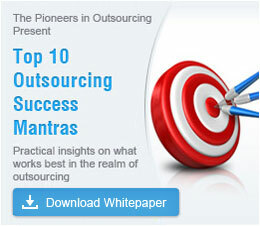 Read on to find out more about how you can effectively manage your business for successful outsourcing. Will better outsourcing management improve my business? Yes, definitely! Outsourcing comes with many benefits, but the entire outsourcing process also requires good management to make it a success. Right from selecting a provider, to negotiating the deal, managing the relationship and dealing with the distributed process, outsourcing needs a good management strategy to be followed by both client and service provider. At Outsource2india, we have successfully provided outsourcing solutions for over 20 years to a large number of global clients. We offer our clients multiple benefits such as defined communication channels, secure knowledge transfer mechanisms and total transparency and control, which make it easy for clients to effectively manage the outsourcing process. What are the core functional areas that I need to focus on? To enable the success of the outsourcing arrangement, a few core functional areas need constant monitoring by both the client and the service provider. Neglecting or overlooking any one area can often lead to the failure of the outsourcing arrangement. Cost is often one the most important reasons cited for choosing outsourcing, as outsourcing enables both the client and the service provider to earn a considerable profit. It is therefore necessary that both parties analyze the scope and pricing of the outsourced project before they sign a contract. Establishing the right communication channels is an absolute necessity for any outsourcing venture to succeed. Communication strategy should be given due importance right from the negotiation stage, with importance being placed on a foolproof communications system, consistent contact between client and service provider, regular feedback, clarity in instructions and the development of a reliable system for clarification of any points in question. Performance management in outsourcing includes both project quality and adherence to the timeframe mentioned in the contract. The client must conduct regular checks to establish whether the quality of work conforms to previously established parameters. The client must also monitor adherence to deadlines and demand accountability reports in case of non-compliance. As with any other aspect of a business relationship, risk management is an important factor to be considered. It is always better that both sides of the outsourcing process analyze and study the various risks involved and have a suitable back-up plan in place before the contract is signed. Doing this will substantially lower any risks involved. A crisis can strike either party of the outsourcing venture, and both sides must be suitably prepared for continuity of business. By choosing a well-established outsourcing provider, however, crisis management can be substantially reduced. Continuous knowledge transfer, with complete transparency in all areas that concern the project, will facilitate better production, improved timelines and increase the overall quality of the outsourced project. For successful knowledge transfer management, close monitoring is needed on a regular basis. A good relationship between the client and the outsourcing provider is essential for the success of the project. Relationships can be effectively managed with regular communication, continual transparency, and by displaying the right amount of flexibility when called for. How can I organize my in-house management team? While the external management of the outsourcing arrangement is vital to the success of the outsourced assignment, the internal management within the client’s establishment also plays an important role in the outsourcing process. While each company may follow a slightly different outsourcing management strategy, the success of the project depends heavily on how well the company implements the strategy in its outsourcing process. O2I delivers customized solutions for a wide range of services that include Call Center Services, Data Entry Services, Engineering Services, Finance and Accounting Services, Healthcare BPO, Software Development Services, Photo Editing Services, Research and Analysis Services, Creative Design and Mortgage Services. Outsource to O2I and take advantage of the many benefits of outsourcing.